Nessya's grandmother, Miri Eneman Malz, has friends, a loving family-and a secret: she is a Holocaust survivor. When twelve-year-old Nessya learns the truth, she wants to know what happened. After decades of silence, Grandma Miri decides it's time to tell her story.It all begins one terrible day in the spring of 1944, when Germany crosses Hungary's border and soldiers arrive in Miri's hometown of Munk cs. Suddenly, the Jews are trapped and in danger.Surrounded by war and unimaginable hatred, the family makes a daring escape. But that is only the beginning, and over the course of the year new threats continually confront them. Incredibly, despite numerous close calls, they defy the odds and live.Based upon actual memoirs, this is the story of the Eneman family . . . of their remarkable ingenuity, astonishing luck, boundless courage, and unending love. Ronit Lowenstein-Malz was born in Tel Aviv, Israel, on May 3, 1960. After graduating from high school, she completed two years of National Service in the Israeli "Bnei Akiva" youth movement. She earned a bachelor's degree in Biblical and Talmudic studies in 1984 and a master's degree in Biblical studies and sociology in 1998. Ms. Lowenstein-Malz worked as an educator and an administrator for over twenty years before turning to writing young-adult fiction. She is the author of nine books and is a recipient of the Yad Vashem prize for outstanding children's Holocaust literature and the Israel Public Libraries Association award for outstanding chil- dren's literature. Escape in Time is her second book. 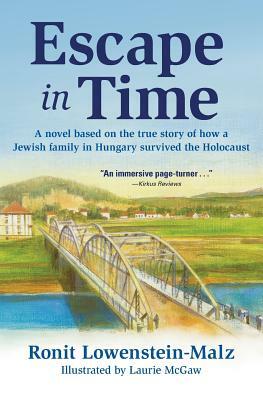 Leora Frankel translated this novel from the Hebrew and Laurie McGaw added fine duotone illustrations throughout, so it's evident that Escape in Time, Miri's Riveting Tale of Her Family's Survival During World War II is not a singular effort, but a long cooperative effort to bring this story to English audiences. And, as young readers ages 12 and older will discover, it's one well worth reading. One might wonder at the need for yet another YA read about a Holocaust survivor - but given the unprecedented nature of genocide and its lasting aftermath, it would seem that new stories should appear every few years as fresh reminders of the lasting impact of events, lest new generations forget, or the classic, widely-distributed writings of such as Anne Frank become overly familiar.